Fee to be Paid: (At the Time of Certificate Verification):1. Processing Fee: Rs.500/- (OC/BC), Rs.250/-(SC/ST). 2. The Tuition Fee payable after allotment varies between Rs.3800/- to Rs. 15500/- per annum depending on type of college allotted. The reimbursement of Tuition Fee in respect of all eligible candidates will be as per the orders issued by Governments of Telangana and Andhra Pradesh States from time to time. 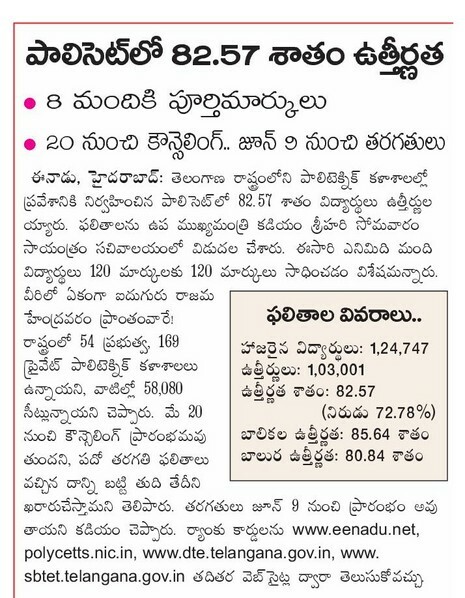 However, all the candidates have to pay Rs 600/- towards TS-SBTET recognition fee as prescribed. Seats available under Convenor Quota College wise will be made available on the website https://tspolycet.nic.in well before the commencement of Option Entry. Candidates are informed that where there is more than one Help Line Centre the ranks are distributed Help Line Centre wise, See the Annexure-I for Distribution of Ranks Help Line Centre wise and attend for Certificate Verification accordingly.ST candidates shall attend for Certificate Verification in the Help Line Centres marked with ** only, as per Annexure-II. PH (Physically Handicapped), CAP (Children of Armed Personnel), Anglo-Indian, Sports & Games, NCC (National Cadet Cops) should attend the Certificate Verification only at Sankethika Vidya Bhavan, Masab Tank, Hyderabad, as per the dates given in the Schedule. Thecandidates residing in Quli-Qutub-Shahi Urban Development Area have to produce certificate of Residence and Ration Card to take seats available in Q.Q. Govt. Polytechnic, Hyderabad and they have to attend for Certificate Verification at Q.Q. Govt. Polytechnic, ChandulalBaradari, Opposite to Zoo Park, Old City Hyderabad on as per the above schedule, see the Annexure-III.